A recent article published by Richard Greenfield from Pali Capital / Pali Research has been widely quoted on the web. It debates the future for Facebook (http://www.facebook.com/) and has caused quite a stir! or the text of it can be read below. content that has a greater likelihood of success. • Historically, personal discussions/water cooler conversations played a leading role in awareness or “buzz,” significantly impacting (what we term “influence”) on content’s success. • Social networking takes “buzz” to a whole new extreme as users are always connected to their entire network of friends, family, colleague, and business associates without ever needing to pick up the phone, meet for a drink, or have any form of live conversation (while this may be a frightening or ”sad” statement on human evolution, it is simply the reality of the world we are becoming). Even if you are not actively participating, you are being exposed to your connections’ media life (what we term as “influencers”), which will increasingly impact your own media consumption habits (even more so than generic advertising). everyone and everything on the Internet today. • Third-Party Applications. Social networks are only as good as their ability to keep providing their users with more to do and more reasons to keep coming back. Facebook has enabled a platform that essentially enables anyone to create their own business within Facebook; better yet, those businesses do not have to pay Facebook anything at all and are allowed to retain 100% of the revenues they derive from their applications (Facebook does not even serve ads on the portion of the page it retains control of) – applications simply have to work within the Facebook platform, with Facebook’s toolset surrounding the outside of the application. This open-source infrastructure, similar in some ways to Wikipedia, Firefox and Wordpress, removes the pressure and cost of development from Facebook itself. however that list of Friends is stuck in Netflix and cannot be used anywhere across the Internet. Whereas, the Netflix application on Facebook leverages everyone within your Facebook network that has Netflix (and who agree to allow you to see their Netflix queue and recommendations). Same idea plays itself out with Youtube, as the site itself has a community feature to create groups of people that can share each other’s favorites, whereas the Facebook myTV application leverages your friends and networks/groups already existing on Facebook. - While media (music and video) content is still in its infancy within Facebook’s new thirdparty application feature, we believe there will be enormous development in this area over the next several months. In less than a month, the top Facebook application has 6.1 million users and the number two application (related to music discovery, called iLike) has 3.7 million users. - Media companies should jump at the chance to spread their content virally utilizing video applications (both proprietary and thru aggregators) as they are created. • News Feed Drives Discovery Mechanism. What we found so unique about Myspace initially was how users were so willing to share information about their favorite television shows, bands, movies; essentially providing a series of data points describing who they were and making it available for anyone in the world to see. The problem with Myspace is that you never know when any of that information was added, changed or deleted – it is not a two-way interactive mechanism. Facebook has solved that problem with the News Feed function. While initially it was far too invasive because every detail of your life was instantly highlighted to everyone you were connected with, it has now been fully reengineered to give users complete control to highlight (or “feed”) only the changes they feel comfortable disclosing. them to trial the application or at least learn more about it. - If one of our friends gives a 5 star rating to Knocked Up using the Movies (Flixster) application, integrated into Facebook, all of a sudden someone we know and trust is influencing our desire to see the film; far more powerful than picking up a newspaper and reading a generic review or watching a trailer on television or the Internet. willing to share with the entire world due to privacy concerns. - We still feel like Facebook could go farther in this respect as all Friends are treated the same, and as your network of friends grows to colleagues, businesses relationships, etc…Facebook needs to segment out this functionality (would not appear to be overly challenging from a technical standpoint). other, likely implies their “influence” on you will be that much greater. - While profiles can be made private on Myspace, the excitement of the service is its openness. While Myspace management could replicate the Facebook model, we do not get the sense they are being pushed in this direction aggressively by News Corp management. - Facebook is like the “Apple” of the Social Networking. A structured product that is simple, user-friendly and works well, even as usage grows dramatically; its just “fun” to use. Next Portal Transformation About to Occur and Facebook will be a Big Winner. The AOL.com, Yahoo.com, MSN.com, Comcast.net homepages are leading portals or aggregators of content on the Internet today. Yet, they are all starting to feel like the AOL dial-up walled garden of 10 years ago – people used it because it was the best method at that moment, but technology changes and so does consumer behavior. Even the likes of myYahoo and myAOL feel incredibly outdated in the context of the Internet’s greatest power – the interactivity and interrelation of people using the Internet. We can see the top most searched for items on AOL’s homepage, or the top radio stations being listened to, but there is no vibrant social networking that can tie the page’s content together with people you know and who you want to interact with. While they can incorporate RSS feeds of news and information, they still feel static. Facebook on the other hand can become THE PLATFORM that unites the applications and services you believe are the best on the Internet and allow you to instantly overlay your social networking fabric on top of it. No reason why Yahoo’s Flicker, Time Warner’s TMZ, or Joost’s P2P IPTV services could not become applications within Facebook. We believe the user experience within Facebook would be far better, particularly because the applications could leverage Facebook data about you, your preferences, your friends and your friends’ preferences, to optimize your experience. these and other companies deal with the Facebook phenomenon? Existing Broadband Portals are at Risk. Without a strong social networking component, traffic will inevitably be hurt as Facebook gains steam by incorporating the best of the Internet’s features and functionality via applications. We do not expect this pressure to occur overnight, particularly as Facebook is still in its early stages, but over the next several years, behavior is going to change. - Yahoo, AOL and MSN need to buy Myspace or Facebook. Buying Myspace would enable any of these companies to overlay a massive social network with their own content and services, while providing Myspace with much needed new products; as well as a more compelling user interface. Combining any one of the portals with Myspace, would provide the best method of competing with Facebook. Microsoft is likely the buyer that is most desperate to buy Facebook or Myspace to develop an Internet strategy, with AOL solely focused on driving EBITDA as high as it can in the near-term to ease the management transition underway at Time Warner (versus making another bold strategic moves so soon after shifting to a free service), and who knows what Yahoo is thinking, they should have bought Facebook when they had the chance. - Comcast would be an unlikely buyer, because it does not even have cutting edge proprietary content or features to integrate with Facebook – it would need to buy far more than Facebook or Myspace; albeit it would catapult Comcast into being far more than a cable and telecom company. Myspace Needs to Innovate Faster or Merge with another Major Internet company. While the value creation that has occurred at Myspace over the past 24 months is hard to fathom, with Myspace now generating over $30 million per month in revenue on its way to an estimated $60 million per month a year from now, the longer-term risk is the lack of an open architecture and two-way interactivity with its user base. 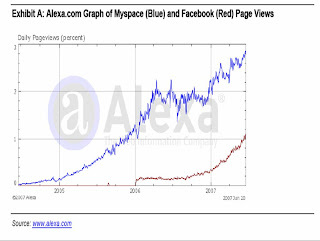 Myspace could be even more powerful than Facebook, given its size and global scale; on the other hand, development at Myspace is occurring far too slowly (applications such as IM have gone nowhere for months and the much anticipated News Section has had zero traction). value creation for it or a newly merged Yahoo/Myspace to turn around and buy Facebook. Every Big Media Company Should Want to Buy Facebook Now. Assuming Facebook’s growth trajectory continues as we expect, the knowledge that could be harvested from controlling the Facebook platform would appear to be the most valuable data in the history of the media world. While Facebook may be a technology company with only $5-$8 mm of revenue per month with little to no profits at the moment, it has the power to impact media consumption on a global basis – why shouldn’t every media company want that – regardless of how investors react initially? - Somewhat ironically, given their current control of Myspace, News Corp. appears to be the most logical media company suitor for Facebook. - Disney only wants to be a content company and has shied away from anything that smells of distribution, while Viacom should want to buy Facebook, but has promised investors it would not spend $1 billion for Facebook six months ago (with the price tag now multiples of that price, if it’s for sale at all). What about Apple, Google or Sony Buying Facebook? -Apple is interesting as it would provide an incredibly elegant platform for Apple to integrate a best in-class social networking platform with Apple’s world-class devices, making it that much easier to share information and interact with other consumers (particularly those with Apple devices who you know). - Google is an unknown and could simply buy Facebook to prevent others from buying it, on the other hand they have not shown much interest in social networking applications. Google’s focus appears to be great applications and services that could ultimately work well within the Facebook platform. - Sony would also be interesting fit for Facebook, as it is the only company that controls content and end-user (device) technology but does not yet have any strategy to tie all of its assets together. CONCLUSION: Simply Try Facebook, Seek out Your Existing Friends / Family / Colleagues / Business Associates, and Get a Feel for the Future of Media; ponder the growth trajectory shown in Exhibit A.